The first thing we see in Gravity is Earth, surrounded by space. Slowly, as the camera floats forward, we make out a white space shuttle gliding through the blackness, and then we see human figures attending to that machinery. The camera continues to move forward, above and below these astronauts, circling them as they work. Of the three people at work, we are quickly introduced to two – Dr Ryan Stone (Sandra Bullock) is diligent but anxious as she carries out her first task in space, while her veteran colleague Matt Kowalski (George Clooney) happily cracks wise and enjoys the view, cherishing his final moments in space before retirement. It appears to be a routine mission, but Stone and Kowalski are in for a rude awakening as a storm of debris comes hurtling towards them, destroying their craft, killing their crew and severing their connection from each other, with a panicked Stone hurtling out into the endless darkness. 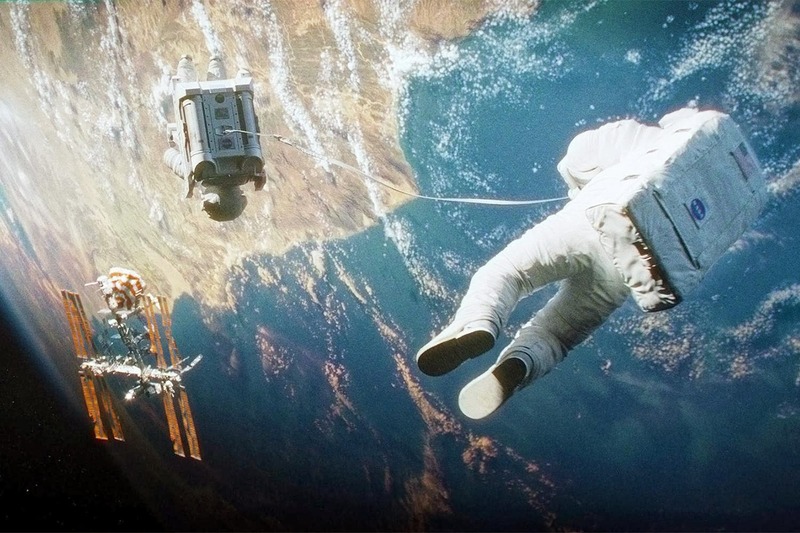 All in all, Gravity is a technical tour de force. The last film that Cuarón and Lubezki collaborated on was 2006's Children of Men, which was similarly elevated by their bold and innovative camerawork, but the addition of cutting-edge effects work and a third dimension has allowed them to push their ideas even further. The film constantly plays with our sense of scale, isolating its characters against the vast emptiness that surrounds them, before rapidly bringing us into close quarters with them as they collide with one another, or crash into a satellite and desperately try to grab something, to avoid being carried by their momentum away from salvation. Bullock spends much of the film being tossed against objects like a rag doll, unable to arrest her inexorable fall, but the physics involved in her movements all feel incredibly convincing. The filmmakers' exacting verisimilitude in their depiction of space and Lubezki's dynamic camerawork makes Gravity an extraordinarily visceral experience. While the visual work pushes at the boundaries, however, the story that Cuarón and his son Jonás (who has directed a short companion piece, entitled Aningaaq)have chosen to tell is very traditional, even quaint. From the minute that Dr Stone finds herself lost in space, the film becomes a very straightforward tale of survival, with Stone having to find a way to get from A to B, negotiating an ever-escalating series of obstacles and disasters as she does so. In case that sounds too slight for a feature, the Cuaróns have given Dr Stone a backstory. We learn that her daughter died some years previously, and that Stone has been drifting aimlessly through life ever since. It's an unabashedly corny device, and the symbolic gestures that the Cuaróns use to present the story as a metaphor for overcoming grief and reconnecting with life can be a little on-the-nose, but they get away with it. Given the disorientating manner of the viewing experience, the straightforward simplicity of the screenplay actually works in the film's favour, and Bullock brings a raw emotion to her performance that grounds the film in a recognisable, relatable reality. The sight of a tear emerging from her eye and floating away rather than rolling down her cheek might seem like a gimmicky 3D trick, but there's no doubting the source of those tears. Whether Gravity will stand up to repeated viewings, once the sense of excitement and awe has faded away, is open to debate. It doesn't feel anywhere near as resonant as Children of Men, and I suspect that the shortcomings occasionally displayed in the writing may become more of an issue over time. None of that matters now, though. Gravity thrilled and gripped me in a way that few recent films have managed to do, and I certainly can't recall the last major effects-driven studio blockbuster that has had such an impact on me (or the last such film to get its business done in a mere 90 minutes). It is one hell of a ride, and its flaws seem entirely meaningless as I gazed in wonderment at the remarkable images Cuarón and Lubezki had produced. These two constitute one of the most exciting partnerships working in contemporary cinema – who could resist the opportunity to watch them reaching for the stars?